New Location Opening Q2 Of 2019! Get Directions To Our Current Location. The Gym Las Vegas is all about real results. We welcome student-athletes and adults of all ages who are ready to see real change through our personalized programs. We’re serious about seeing positive change in your fitness, your health, and your body. that causes reduced performance. From this assessment, The Gym’s personal trainers guide you on the path toward a safe and effective fitness experience. The Gym Las Vegas wants each of its clients to receive the necessary ingredients for a successful fitness experience and lifestyle. 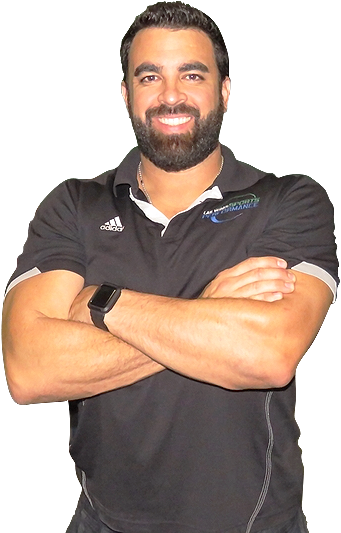 Rob Martinez is a certified expert in sports specific training, functional movement, and injury reduction. With Rob at The Gym Las Vegas, you can find a whole new approach toward a healthier lifestyle and higher fitness level, with unique goals and a welcoming environment. Rob Martinez founded The Gym Las Vegas to improve your life with a more effective and safe approach. The LVAC suggests that they provide a safe and effective training environment but without much of an explanation about how they provide it. The Gym Las Vegas understands the importance of limiting your injury risks, which is why every journey starts with an assessment to determine your fitness level, range of motion capabilities and limitations, and see how your body works, to create a custom plan that is built for your body. The LVAC has a welcoming environment, just like The Gym Las Vegas, but The Gym is also focused on a detailed and personalized approach to discovering the best way to help you reach your fitness goals. The Gym Las Vegas meets you where you are at in your current fitness level. When a gym works with you and targets your specific needs, only then will you can begin to see your fitness goals come to life. The Functional Movement Screen is used to determine your fitness level and range of motion! Our personal trainers put you on the path toward moving, looking, and feeling better! At The Gym, we offer the solution for success with focused fitness personalized for you! The Gym Las Vegas provides real results. No counterproductive techniques or fad diets. The Gym Las Vegas doesn’t want you just to feel comfortable, but to be safe and attain real results that have been proven through a unique plan and structure. The Gym aims to provide success from the training programs and classes that are uniquely designed to fit your life and your body. The evidence is clear that The Gym Las Vegas is the ultimate gym when it comes to a safe, productive, and proven fitness lifestyle. The Gym dedicates its time toward truly helping create healthy lives through its proven approach and process. Most gyms throw you into a workout or plan that can feel overwhelming and confusing – especially when the results don’t show. The Gym Las Vegas has what you need for a safe, effective, and result-filled gym experience. With a dedicated staff of experienced personal trainers, who desire to help you on your path toward a healthy and increased level of fitness, the sky is the limit. The Gym has combined the necessary balance of injury prevention and explosive performance into its training programs. You will reach your fitness goals with The Gym Las Vegas, starting today! The Gym Las Vegas is the best in the area for custom training programs in a safe environment. We build programs based on an assessment to get you on your way toward real results. The Gym Las Vegas offers personal training, group fitness, and sports specific training programs for student-athletes and adults of all ages and fitness levels. © 2019 The Gym Las Vegas. All Rights Reserved. Crafted with care by Hatchtag.